Mr. Le Vell is a Manchester native and was born in 1964. His real name is Michael Turner. His first role on Coronation Street was as paper boy Neil Grimshaw when he was only 16. He was working as a plasterer to pay the bills while he struggled to get his acting career launched. 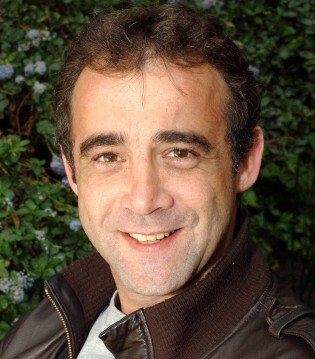 He anded the role of Kevin Webster in 1983 after auditioning for a different show and the rest is history. He celebrated 25 years on Corrie in the fall of 2008. His parents died when he was young and Liz Dawn took him under her wing when he was first on the show. . He's married to an actress, Janette Beverley and they got married the same week that his wedding to Sally aired on screen in 1986. They have two children, a boy, Finley and a girl, Amelia. Janette actually had a short role in Corrie, as one of Curly Watts' girlfriends. Did you know that Michael is an avid Manchester United fan and that he's a poker champion? He also plucks between his eyebrows to "open up" his eyes, rather than looking permanently angry. This was suggested to him by Johnny Briggs. Kevin arrived on Coronation Street in 1983, a hitchhiker that Alf Roberts picked up. He then fixed Alf's car. Soon after, his family, widower dad Bill and sister Debbie all moved into Number 11 after Elsie Tanner moved to Portugal. Her daughter Linda arranged for the house sale. Kevin lodged with Hilda Ogden after his dad married Elaine Pryor and moved to Germany and she enjoyed being surrogate mum to him. He met Sally in 1986 when he accidentally splashed her as she was standing waiting for a bus. They didn't date straight away but soon found love together. On the way home from an all night rave, they realized the Rovers Return was on fire and they raised the neighbours and the alarm. Kevin also helped save Bet from the fire. Later that year, he and Sally married. They first lived in the flat over the shop for awhile until Hilda decided she was going to sell up and move. They bought Number 13 and lived there until 2008 when they swopped houses with the Peacocks. His dad Bill is back from Germany, divorced from Elaine and also from Maureen whom he married in the 1990s. Bill is currently living with the Websters and runs the builder's yard. We never hear about sister Debbie. Kevin has been married three times, twice to Sally, and once to Alison who walked out in front of a lorry after baby Jake died and she'd taken off with Sarah Louise's baby, Bethany. Kevin's dad, Bill, treated the whole family to a holiday in Paris for the 20th anniversary of Kevin and Sally's first wedding. He is the father of Rosie, Sophie and Jake (deceased). He dated Molly Hardcastle, the nurse at the medical centre but she dumped him because he still had feelings for Sally. He's usually looked the other way during some of Sally's affairs, (Alex the builder and Ian Davenport), decked some of Sally's fellas even if they were divorced or separated (Chris Collins, Danny, Martin, Ian). He's recently stood up to Tony Gordon's attempt to buy him out. Over the years, Kevin was hired on to work for Brian Tilsley at the garage, then Casey who bought after Brian died. Mike Baldwin bought garage after that and then Don Brennan. Finally Kevin and Tony Horrocks partnered up and bought the garage. He had an affair with Natalie Horrocks after she took over her son Tony's share of the garage. Eventually he bought out Natalie as well and is full owner of the garage. Some mechanics he's hired: Tyrone Dobbs, Nathan, Chris Collins, Jim McDonald, Tony Horrocks, Doug (Deirdre's fella), Mark Casey, Tommy Harris. Between the original garage and the Coronation Street location, Kevin also worked for a garage fitting mufflers and doing menial work. Kevin's got a temper and is a bit of a chauvanist. He's protective of his kids, tolerant of Sally, and is a good family man. His temper landed him in jail in 2008, for assaulting John Stape who had been having an affair with his teenage daughter, Rosie. He's a man of simple needs and pleasures, without sophistication, airs and graces. He's reliable and dependable and a good friend to all.